The growing focus on health and wellness among consumers across Brazil has elevated the demand for clean, flavored, and hygienic drinking water. This, in turn, has resulted in a significant rise in the per capita consumption of flavored and functional water in the country. The Brazil flavored and functional water market is projected to exhibit a strong growth rate over the coming years, thanks to the increasing demand for convenient, healthy, and energizing beverages. Dietary and lifestyle changes have led to an alarming rise in the rate of obesity and diabetes in Brazil. According to a study published by the country’s Ministry of Health, Brazil has the third largest overweight population in the world. The International Diabetes Federation states that Brazil is likely to exhibit the fourth highest increase in the prevalence of diabetes between 2012 and 2030. These factors are driving consumers to choose healthier dietary alternatives, with flavored and functional water on the list. The opportunity in the Brazil flavored and functional water market is expected to rise at a 7.3% CAGR from 2016 to 2024. In 2015, the market was valued at US$5.0 bn and is expected to reach US$9.4 bn by 2024. By ingredients, vitamins and minerals are expected to witness significant growth over the duration of the forecast period. This can be attributed to the rise in consumer awareness regarding the health benefits of vitamins and minerals and the growing consumption of vitamin-fortified beverages in Brazil. The segment is also projected to exhibit strong growth in terms of value as well as volume. Based on nature, the Brazil flavored and functional water market is bifurcated into carbonated and non-carbonated drinks. The non-carbonated segment is expected to retain its dominance through 2024, fueled primarily by the shift in preference from synthetic ingredients and high-sugar beverages to healthy, zero-calorie drinks. “Growing health consciousness among consumers in the country is a key factor driving this segment,” the lead analyst reports. From a geographical standpoint, the Brazil flavored and functional water market is segmented into south east, north east, south, central west, and north. South-east Brazil is expected to hold a relatively high revenue share in the Brazil flavored and functional water market over the forecast period, accounting for a 38.2% share by 2024. Increasing population coupled with growing awareness regarding the benefits of flavored and functional water is expected to have a positive impact on the revenue growth of the south-east region. In terms of value, the north east will register a 7.8% CAGR through the course of the forecast period. By distribution channel, the retail stores segment accounted for a share of over 35% in terms of revenue in 2015 and is expected to expand at a CAGR of 5.9% from 2016 to 2024. The rapid expansion of retail chains in Brazil has positively impacted the growth of this segment. Furthermore, factors such as convenient locations, one-stop shopping, grab-and-go services, variety of merchandises, and speedy transactions are expected to boost the retail stores segment of the Brazil flavored and functional water market. Key players in the Brazil flavored and functional water market include Groupe Danone, The Coca Cola Company, PepsiCo Inc., Hint Water, Mountain Valley Spring Company, LLC, Suntory Beverage & Food Ltd, Grupo Vichy Catalan, Unicer - Bebidas SA, Icelandic Water Holdings ehf., CG Roxane, LLC, and Ambev. On the basis of nature, Brazil flavored and functional water market is segmented into non-carbonated and carbonated drinks. Demand for non-carbonated drinks is expected to grow at a rapid pace owing to the increased preference for beverages that offer low calories, caffeine, or other synthetic ingredients. Factors such as rising health consciousness, changing dietary habits, improved living standards, and increasing consumer preference for healthful, convenient, zero-calorie beverages are expected to drive revenue growth of the Brazil flavored and functional water market over the forecast period. On the basis of ingredients, Brazil flavored and functional water market is segmented into vitamins and minerals, botanical ingredients, amino acids, other active ingredients. Growing awareness regarding health benefits of vitamins and minerals coupled with rise in the consumption of vitamin-fortified drinks is expected to escalate the demand for vitamins and minerals segment in Brazil flavored and functional water market. On the basis of distribution channel, Brazil flavored and functional water market is segmented into hypermarket/supermarket, retail store, departmental/specialty outlet, and e-commerce. A detailed analysis has been provided for each segment in terms of market size analysis for flavored and functional water market in Brazil. 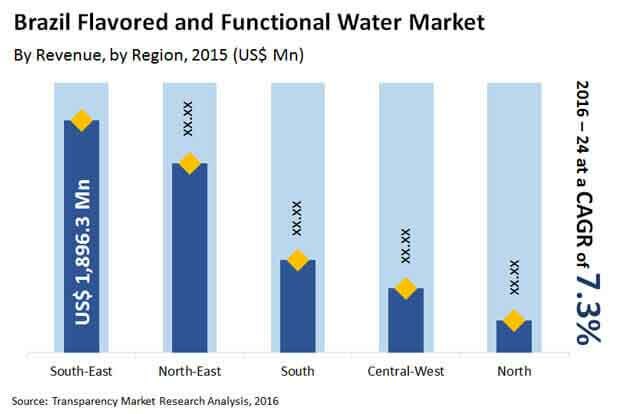 On the basis of region, Brazil flavored and functional water market is segmented into south-east, north-east, south, central-west, and north. South-east part of Brazil is expected to witness relatively high share in the Brazil flavored and functional water market. Increase in per capita consumption of packaged water coupled with growing awareness relating to the benefits of flavored and functional water is expected to support the revenue growth of the region over the forecast period. It is imperative to note that in an ever-fluctuating global economy, we not only conduct forecasts in terms of CAGR, but also analyze on the basis of key parameters such as Year-on-Year (Y-o-Y) growth, to understand the predictability of the market and identify the right opportunities. Another key feature of this report is the analysis of all key segments in terms of absolute dollar. This is usually overlooked while forecasting the market. However, absolute dollar opportunity is critical in assessing the level of opportunity that a provider can look to achieve, as well as to identify potential resources from a sales and delivery perspective in the Brazil flavored and functional water market.